Spending zero dollars is a pretty agreeable thing. Major fast food peddlers are all vying to lure you into their storefronts with free promotions, with McDonald's recently offering gratis fries. But, it turns out you don't have to wait for a free deal to fall from the sky in order snag a free donut via Krispy Kreme. 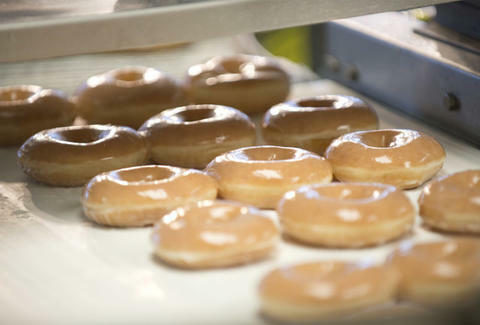 As Delish points out, all you need to do in order to grab a free Krispy Kreme donut today is download the company's app. Being that you're probably an adult with a smart phone, you won't need help downloading the app, which is available in for iOS and Android. Once you download it, you'll receiver a voucher for a free, original glazed donut. You won't be able to use your voucher to commandeer any of the company's new, gluttonous creations, like its Chips Ahoy! And Nutter Butter donuts. Those are for people willing to pay actual money. But still, a simple donut is good enough for most people who rarely get things for free. In what might be a first for corporate donut peddlers, the Krispy Kreme app also lets you accrue points so you can enjoy various perks on offer throughout the year. The company also gives away free donuts to app users on their birthdays, so you've got even more incentive to give Krispy Kreme otherwise guarded, personal information. The chain got people excited last week with the announcement of a new lemon glazed donut, which came via a fan vote. The Lemon Glaze Donut will only be available from April 23 until April 29 at Krispy Kreme locations in the US and Canada. Just think, if you download the app during at any point from now until April 29, you can very well enjoy two donuts for the price of one.